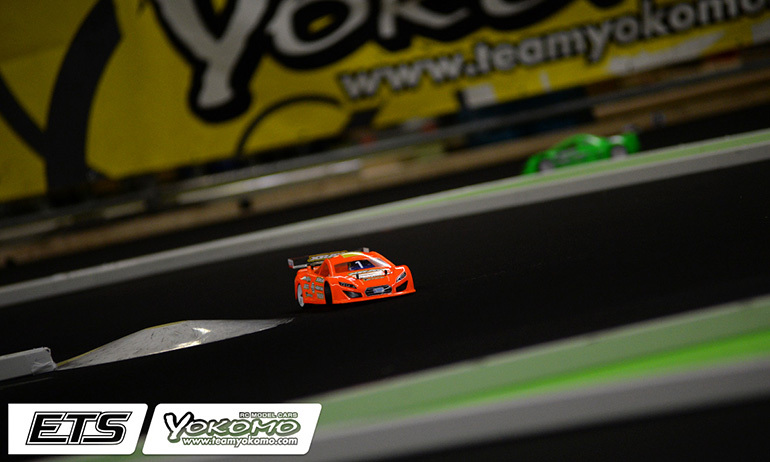 A close opening qualifier at the Yokomo Euro Touring Series second round in German has seen the first strike of the weekend go to Bruno Coelho with the Xray driver just seeing off the charge of a very on-form Freddy Sudhoff. Top seed in practice, Coelho had the advantage of starting out front while Sudhoff had to contend with finding a way passed a slow starting No.2 seed Alexander Hagberg. Setting the fastest lap of the race with two laps to go it looked like Sudhoff was on target for the TQ but Coelho responded with his fastest lap of the race which together with a moment from Freddy on the last lap gave Bruno the first TQ run of the weekend. With the Top 2 having distinct advantage over the rest of the field being the only drivers to make 21-laps, it was Ronald Volker who came through to post the third fastest time with 3rd to 6th separated by only half a second. Behind, Elliot Harper got a 4th from the first of the four qualifiers ahead of Xray team-mate Alexander Hagberg with the Top 6 completed by Christopher Krapp.